The basic kit includes your choice of brass and six of both types of feet. Add more here! As your board ages and gathers character from use (or abuse! ), sometimes it's nice to replace some parts. This kit includes brass (4x3 inch sheet or new precut) for the peg door and both felt and cork feet. Until recently, we individually hand-cut the peg door from brass sheet with a pair of regular kitchen shears. Once cut to shape, with rounded corners, we put a small bend in the center to stop it sliding out by itself. From December 2017 onwards, we mostly use a machined door, made from the same brass. The dimensions of the new door are 3.5 inches by 1.5 inches, the same size as the majority of board peg pockets. Again, we put a small bend in the center to stop it sliding out by itself. Some boards made after Dec 2017 still have different sized pockets so please measure carefully. We offer a 4 x 3 inch sheet of brass big enough to replace a large peg pocket or regular-sized pocket with enough left over for a second try if you mess up the first one! 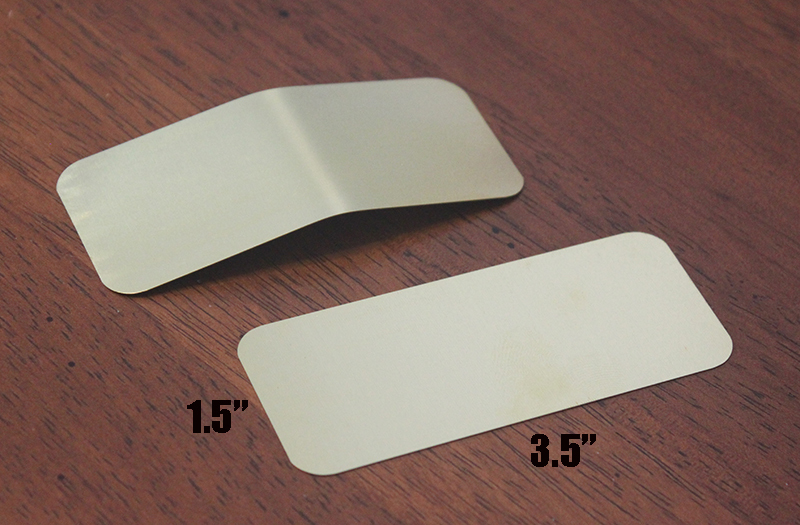 We also offer the new 3.5 x 1.5 inch brass door already cut to shape. Please measure your peg pocket carefully to make sure which option is best for you, or add one of each! Extra brass sheets are available if you require. We use mostly felt feet, although cork feet work well for some boards. 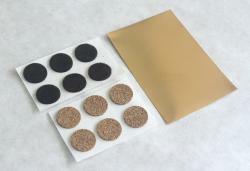 The kit includes six felt and six cork feet. Gently peel or scrape off the existing feet, working inwards to the center, and put the new feet over any remaining mark. Sometimes if the board develops a little wobble, as the wood reacts to the environment, a double layer is needed in one corner. Extra feet are available if you require. The kit is usually sent out USPS First Class without tracking.